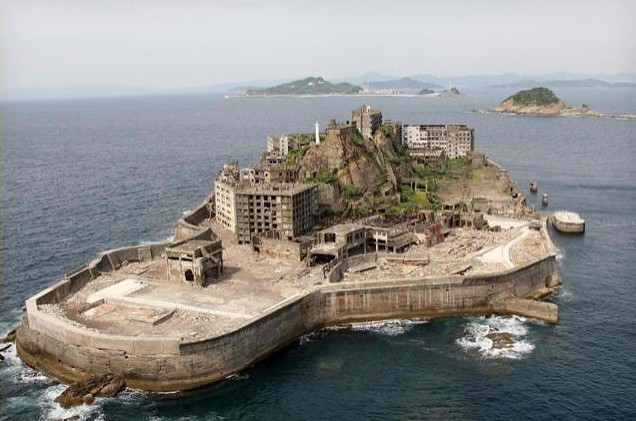 In Skyfall, the Japanese island of Hashima serves as the secret headquarters of Raoul Silva, the well-coiffed Bond villain played by Javier Bardem. In reality, it serves as a sobering reminder of the pitfalls of industrialization, and the human toll it can exact. Late last month, Messy Nessy Chic published a detailed history of the island, which, at the turn of the 20th century, was a bustling coal-mining town owned by the Mitsubishi Corporation. Things took a turn for the sinister at the dawn of World War II, when the Japanese turned the island into a bona fide labor camp for Chinese and Korean prisoners. By 1959, the island boasted the highest population density on Earth (139,100 per square kilometer), and living conditions soon deteriorated. That changed once Japan turned to petroleum, and today the island is completely abandoned and degraded, as it has been for the last 38 years. In 2002, Swedish filmmaker Thomas Nordanstad visited the island with a Japanese man named Dotokou, who grew up on Hashima. The occasion marked the first time that Dotokou had been on the island as an adult, and his experience is nothing short of harrowing. Throughout his visit, the former Hashima resident excavated memories from his childhood, gazing at the decorations his mother hung on their apartment walls, and paying homage to a deceased friend with whom he grew up. Nordanstad documented the trip in a film called Hashima, Japan, 2002, embedded below in its entirety.